Client wanted a large outdoor entertainment area in a style that complimented the house, and created privacy from the neighbouring property. It needed to incorporate an existing BBQ. Walls were created to ensure privacy and protection from prevailing winds. A large bench space area was included, behind which space for a herb garden was allowed for. 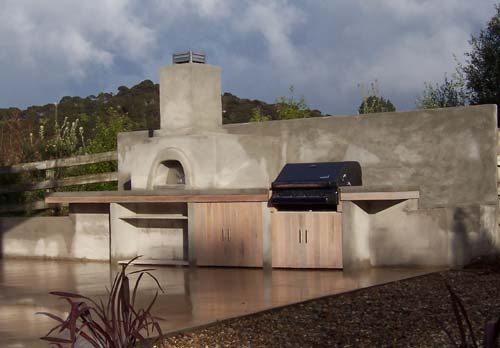 The wood-fired pizza oven design complimented the lines of the house and also included a smoker in the chimney. Storage cupboards were built under the bench and a firewood storage area was created under the wood-fired pizza oven.